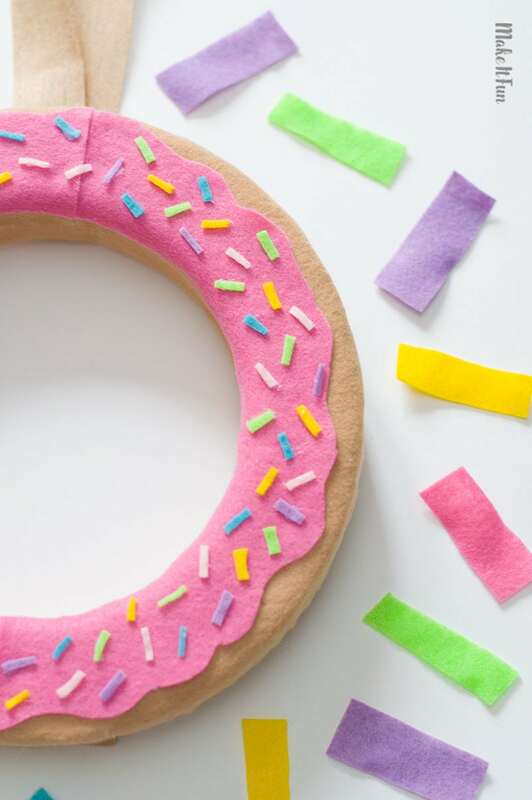 Today I’m sharing a DIY Wreath – Donut Craft I made for the Make it Fun Blog. It was just National Donut Day and I thought this was a perfect craft to share with everyone. I did a donut kids craft last year and I thought it turned out super cute so I had to make an adult Donut Craft for the house! 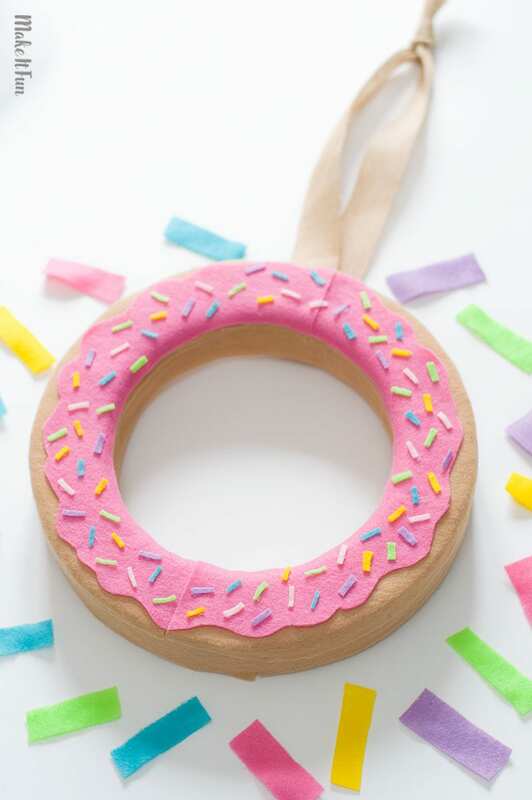 Today’s project is a DIY Donut Wreath! 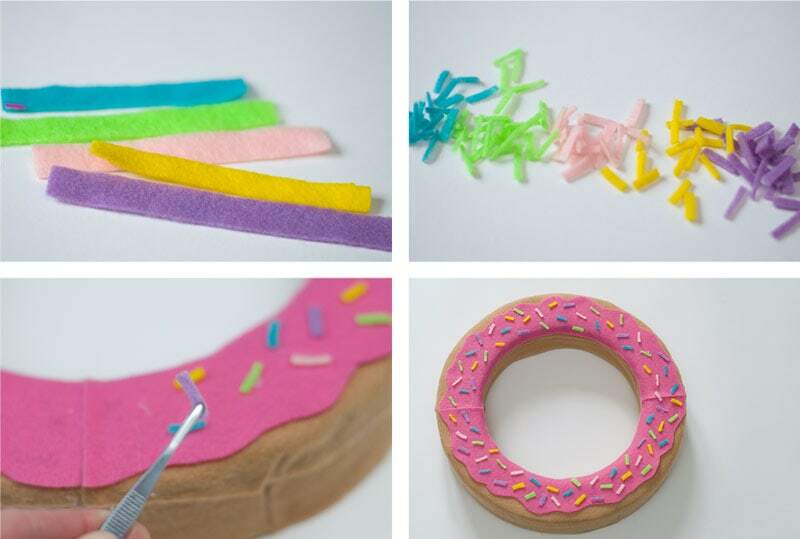 Donut crafts are so trendy right now and so fun. People are even having donut themed parties and substituting traditional wedding cakes for donut towers! The colors are bright and perfect for kids room decor or your own upcoming donut party! 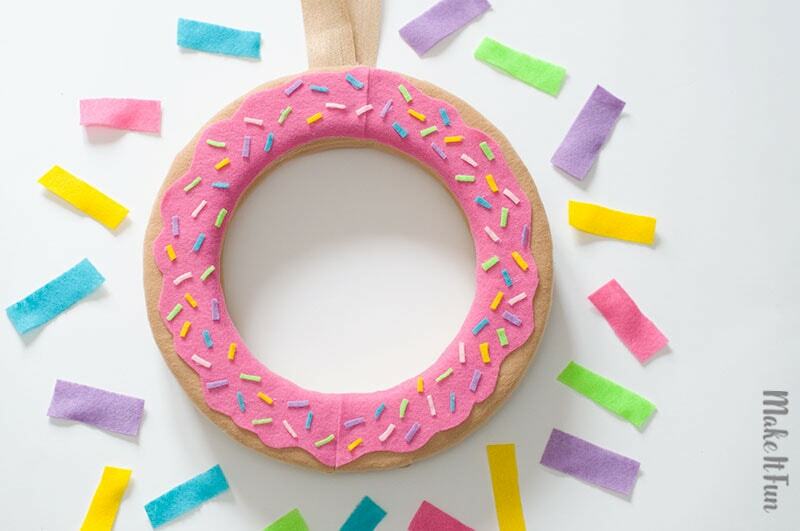 The foam wreath form is the perfect shape to use when making a donut decoration. Let’s get started! 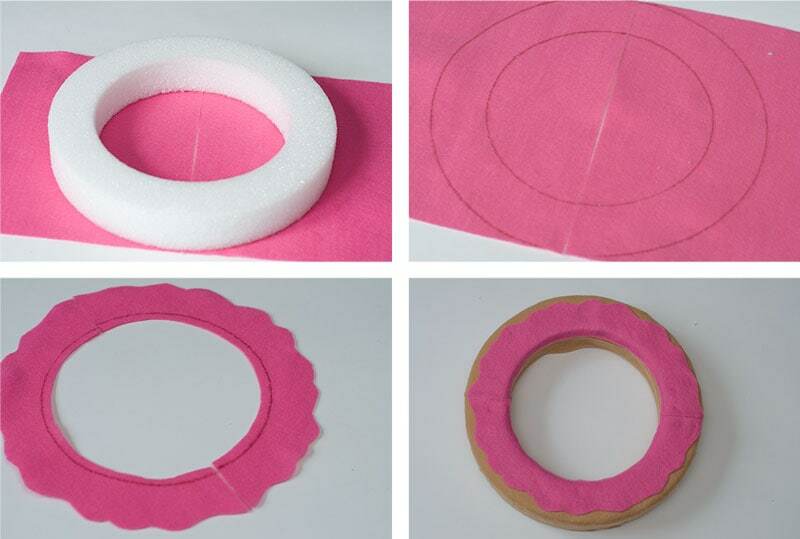 I started off by cutting strips of tan felt (for my cake donut) the same thickness as the wreath. Then glue them around the inside and outside of the wreath to cover the sides. Make sure to use a low-temp glue gun for this project so you don’t melt the foam. To cover the face of the wreath, trace the wreath onto the felt as shown below. I made sure to leave a little extra on the sides to hang over the edge. 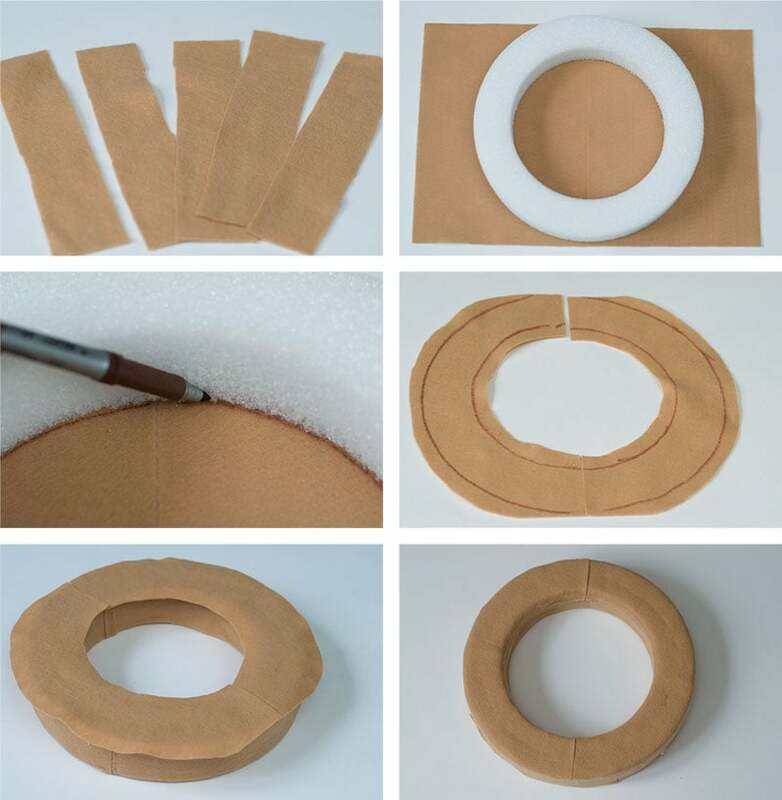 When you wrap the felt over the side, it will give you a seamless look. Now it’s time to add the frosting! Trace the wreath shape again onto your frosting felt and cut out. Then, using your scissors, cut a wavy edge around the outside to look like frosting. Glue the frosting on top of your donut. Now add the sprinkles! Cut 1/2″ strips of felt in sprinkle colors. Then, start cutting them into little pieces to look like real sprinkles. Add a little dab of glue to the backs and gently place them onto the wreath. Finally add some ribbon or a strip of felt to the back with glue and you’re ready to display! You can make any color donut you wish! 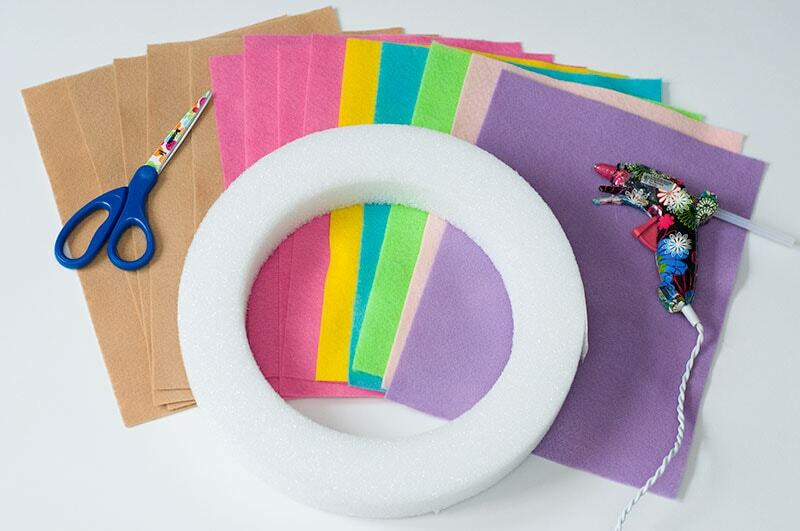 Feel free to snack on a donut or two while making this craft…no judgement here! Thanks for stopping by! I hope you enjoyed this donut craft and it’s inspires you to make one of your own! !